Chateau Drugs and Gifts is a member of NCPA. Diane Milano with U.S. Department of Health and Human Services Secretary Alex Azar. METAIRIE, La. 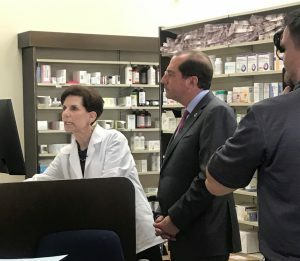 — U.S. Department of Health and Human Services Secretary Alex Azar yesterday visited Chateau Drugs and Gifts in Metairie, La., which is owned by National Community Pharmacists Association (NCPA) members Kerry and Diane Milano, both of whom are registered pharmacists. Azar made the visit to help highlight efforts by the Trump administration to lower prescription drug prices. Among topics discussed were the 2018 laws to ban so-called “gag clauses” that prohibited pharmacists from disclosing more affordable prescription drug options to patients, the recently-proposed policies to end retroactive pharmacy direct and indirect remuneration fees, and the proposal to exclude from the discount safe harbor the rebates paid by manufacturers to plan sponsors under Medicare Part D and Medicaid managed care organizations. Also present for Azar’s visit were a number of other community pharmacists and patients from the New Orleans area. This is Azar’s second official visit to a community pharmacy within the last four months.